The dollar has fallen to a four-week low in currency spread betting markets today, with demand for the currency declining following the publication of a sharp revision to the estimate for US gross domestic product (GDP) growth in the first quarter of the year. According to the third estimate produced by the Commerce Department and presented in its latest report, the American economy shrank by 2.9% over the three months to the end of March. This represents a much sharper contraction than the previous forecast for a 1% drop and is representative of the US economy's worst quarterly performance in five years. Economists have attributed this slump to the unusually cold weather conditions experienced across much of the country in the early months of the year and it is widely expected GDP growth will rebound in the second quarter. However, the distance between the second and third estimates is the widest on record and the latest report shows it is a drop in consumer spending, which accounts for two-thirds of the US economy, that is mostly responsible. This figure increased by just 1% in Q1, but this was previously-reported as a 3.1% gain. The dollar was further hampered by separate Commerce Department data revealing durable goods orders unexpectedly declined last month. Despite expectations for an unchanged result, a fall of one% was recorded and this has led to suggestions the GDP rebound anticipated may not be as strong as first thought. Following the release of the data, the dollar spot index declined by 0.2% to 1,007.56, its lowest level since 19 May. 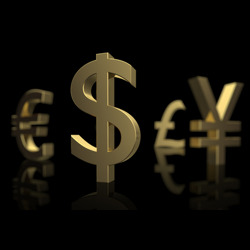 This gauge measures the dollar's progress against ten major forex trading peers. In addition, the currency is set to record its tightest quarterly trading range versus the Japanese yen since September 2012, with the stimulus actions of major global central banks helping to limit price swings.